WELCOME TO THE WORLD OF INVISIBLE PAINTING !!! I SELECTED THIS PAINTING BECAUSE OF IT'S MULTI-PURPOSE UTILITY! 2ed- It is muilti-purpose in that I can draw any lesson in the White area above the Bible. 3rd. 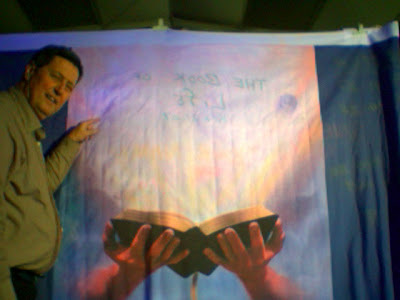 It is easy to put any invisible painting in the white area above the Bible. And 4th- the chalk washes out leaveing the color background ready to start something new. 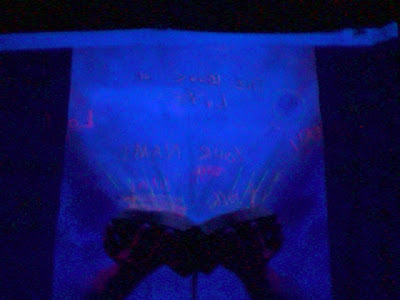 This is what it lokks like with a black light. I have 4 different TITLE PAGES PAINTING on permanent color back grounds. WELCOME TO THER WORLD OF INVISIBLE PAINTING !!! The above painting is a color copy ( 4ft by 6ft ) on a flourescent cloth ( Bible Baptist Book store ,Pensacola, Fla. ---cost: $ 75.00 ) Then I over painted it with a combination of 'FLOURESCENT PAINT", " FLOURESCENT CHALK" sprayed with a fixitive- hair spray works well. And I also used '"FLOURESCENT CRAYONS ". AND SOME INVISIBLE PAINT ETC. 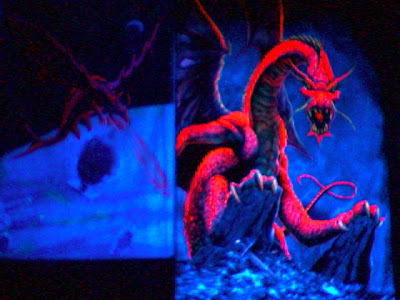 The 2ed painting above is what it looks like with a black light: Very dramatic effect !!! INVISIBLE PAINTINGS...3D....FLOUYRESCENT PAINT, CHALK, & CRAYONS ,INVISIBLE PAINT ETC. I usually do an American Indian painting on Monday night. We have a 4 hr. video on the American Indians and the Bible. In it I do 4 different invisible painting. The black light makes it look 3D . 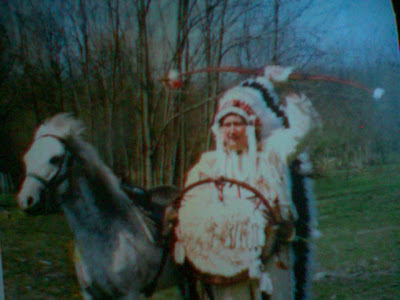 And I put on my American Indian clothes to make it even more 3D. 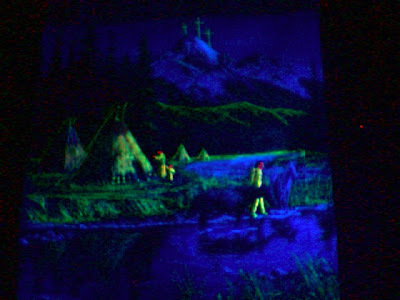 Below, in the top picture you can see part of the black light picture on THE INDIAN AND THE SNOW." I mentioned this a couple of days ago. I also have it snow inside --3 different ways. I also take a picture of each child with Chief Guillermo who arrives early. The kids love having their own poloroid photo with Chief Guillermo. Some times I even borrow a horse as you see in this Photo. Later, we will deal with the other invisible Indian paintings. So the black light with FLOURESCENT PAINT , AND INVISIBLE PAINT make it..... 3D..... The Snow makes it ...3D... and the Indian clothes and the real horse again makes it ...3D.... !!!! WELCOME TO THE EXCITING WORLD OF INVISIBLE PAINTING !!! 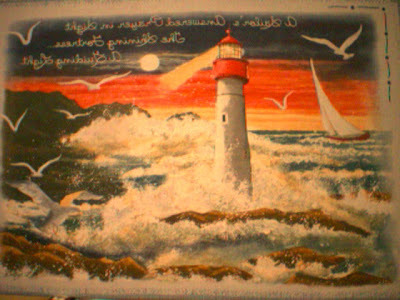 INVISIBLE PAINTING--3FT BY 5FT--WALL HANGING--FLOURESCENT PAINT ETC. Here we have a large photo copy painting from Wal-Mart (cost $ 3.95 ) Which fits into a whole series of pictures I am doing: "SOME FISH I HAVE KNOWN" ; "SOME BIRDS I HAVE KNOWN "; "SOME SNAKES I HAVE KNOWN"; and here we have the next one : "SOME DOGS I HAVE KNOWN". There are several large wall hanging like this . I'm sure you have seen them at some time. 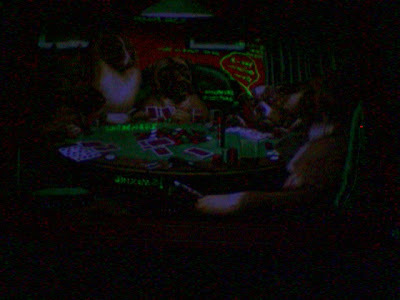 Here the dogs are smoking cigars, drinking beer, cursing, and cheating and gambling. So I over paint this with flourescent paint, chalk, and crayons . Turn on the black light and you have a great and dramatic presentation. 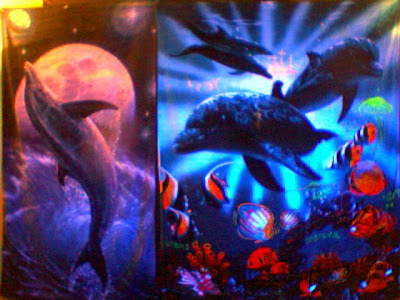 INVISIBLE PAINTING:-CLOTH COPY-BEACH TOWEL-BEACH BLANKET-- FLOURESCENT CRAYONS; & SPECIAL LIG HTS . WELCOME TO THE WORLDB OF INVISIBLE PAINTING !!! WELCOME TO THE WORLD OF INVISIBLE PAINTING !!! 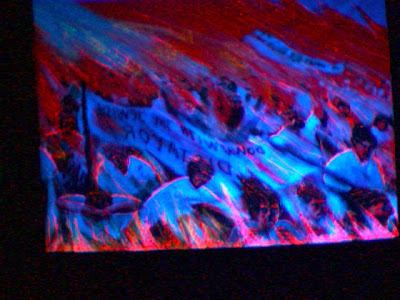 a dramatic black light presentation. AS YOU CAN PLAINLY SEE ! So I painted over the "terry cloth" with flourescent paint which was different. And then I painted the INVISIBLE PICTURE into the painting. This cloth like most has a natural flurescent quality to it. The kids just loved this lesson. It was large (beach towel 5ft. by 6ft.) and it was dramatic.. They JUST LOVED IT. Here we have a 4 ft. by 8ft. 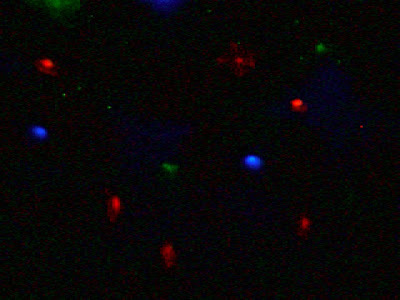 color copy background ON FLOURESCENT CLOTH (. THE ONLY PLACE THAT MAKES THESE IN THE BIBLE BAPTIST BOOK STORE. PENSACOLA, FLA. ) The ones they have , have words on them. But you and asked them to leave the words off. They have several ( 4ft by 6 ft. cost $ 100 ) . And you can send them a picture you want to blow up... and they will make a special order ( cost a little more about $125 ). Now I could paint the painting myself but then the flourescent chalk would not stick to the painted surface. So the color copy backgrounds are preferable to my doing the painting myself. 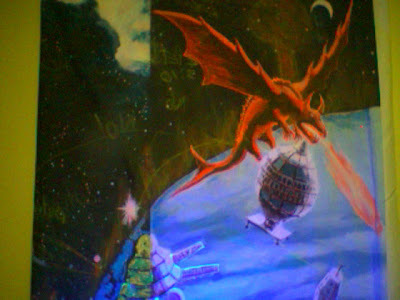 Then I paint over it with "FLOURESCENT PAINT & INVISIBLE PAINT "... turn on the black light and watch the reponces. WELCOME TO THE WORLD OF INVISIBLE PAINT !! INVISIBLE PAINTING:-CLOTH COPY BACKGROUNDS-- FLOURESCENT CRAYONS; & SPECIAL LIG HTS . I then painted over it with flourescent paint, chalk, and flourescent crayons. turn on the back light. It is much better than the photo above.. So check out those comic books for pictures. 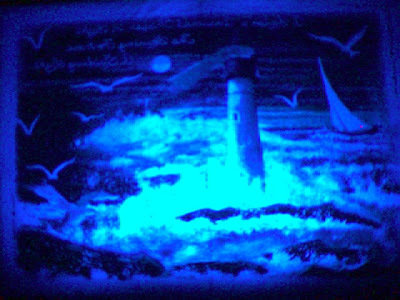 INVISIBLE PAINTING:-CLOTH BEACH TOWEL-- FLOURESCENT CRAYONS; & SPECIAL LIG HTS . WELCOME TO THE WORLD OF INVISIBLE PAINTING: The above is a comparison of a color painting on cloth (cost $ 50 ) and a color copy on a beach towel ( $ 19.00) . 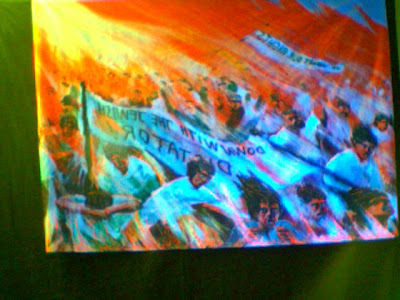 This is with "WHITE LIGHT "
This is the color copy on cloth., woth white light. below is black light. 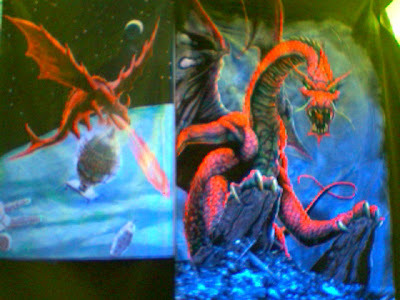 Here we see the copies painted over with flourescent paint, and with a black light. 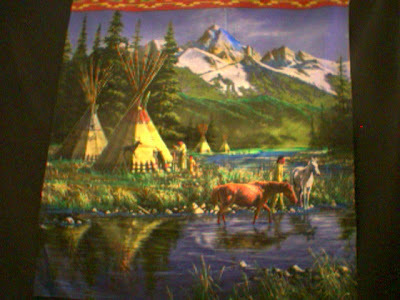 INVISIBLE PAINTING: AMERICAN INDIAN PS.23 ; -CLOTH SHOWER CURTAIN-- FLOURESCENT CRAYONS; & SPECIAL LIG HTS . This is a color copied background on Flourescent cloth. Where do you get these color copied backgrounds ? 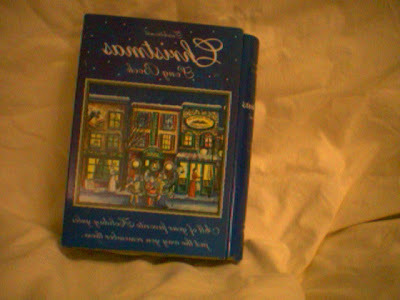 This one I found at a BIG LOTS discount store : cost $ 7.00. It is a cloth shower curtain. 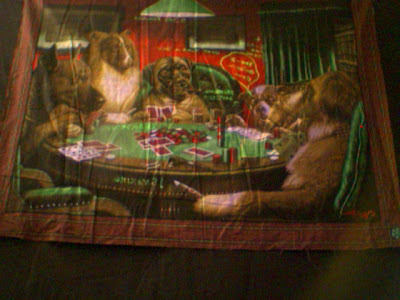 Ordinarily this painting on cloth would cost $ 100 to $ 200. K-MART has some amazing color copies of painting and photos on cloth shower curtains -cost : $ 19.00 ,WAL-MART has cloth shower curtains with paintings and useable photos. Check any store for cloth shower curtains etc. Then I over paint these with "FLOURESCENT PAINT"," FLOURESCENT CHALK", and invisible paint and crayons. The CROSSES are invisible witrh the white light-top photo. This EASY ! FAST ! ECONOMICAL ! and DRAMATIC !!! WECOME TO THE WORLD OF INVISIBLE PAINTING !! invisible PAINTING: SPECIAL EFFECTS __SNOW_-LET IT SNOW !!!! FLOURESCENT CRAYONS; & SPECIAL LIG HTS . I made this from a hollow book ( for candy ) see photo below. 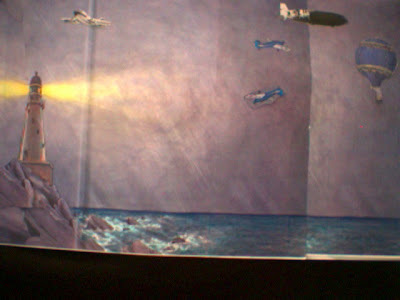 The photo below shows the snow cannon mounted inside the hollow book. You can use any book. 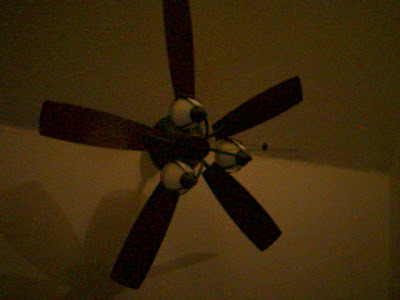 4.When I did this at our house some of the snow landed on the top side of our ceiling fan and when we turned it on the snow came down (small white pieces of paper). So number 4 is if there is a ceiling fan , you can use it to make it snow inside. Before anyone gets there put the snow on top of the fan. I did this in a restaurant Christmas party. My wife sat by the fan electric switch and when I threw the "FLASH PAPER" into the air, she turned on the fan and it started to snow. No one ever figured it out. So make your SNOW PAINTINGS -3-D . WELCOME TO THE WORLD OF INVISIBLE PAINTING---3D---!!! INVISIBLE PAINTING: FLOURESCENT PAINT, GLOW-PAINT, FLOURESCENT CRAYONS; & SPECIAL LIGHTS . HERE, we have one of our newest invisible paintings. 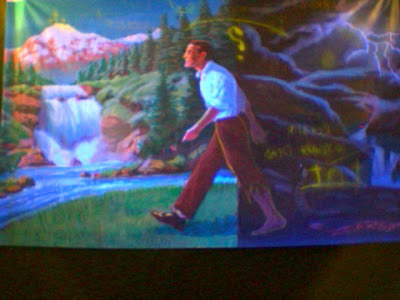 This painting is a composite picture that has been color copied on to a permanent color background. It is 4 feet by 8 feet and it is reusable . 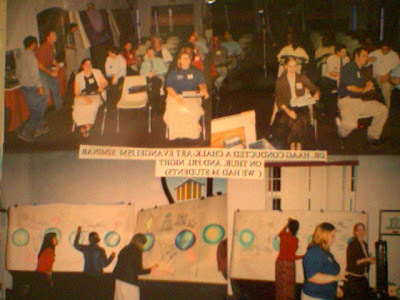 I draw on it with FLOURESCENT chalk and INVISIBLE chalk ( which is washed out in a washing machine ) after each public presentation. The color background is permanently copied on to Flourescent cloth so this really saves a lot of time in getting ready. ( The only place that I know that can make these PERMANENT COLOR BACKGROUNDS is the Bible Baptist Book Store in Pensacola, Fla. This really makes a great presentation very easy. WECOME TO THE WORLD OF INVISIBLE PAINTING ! INVIIBLE PAINTING: FLOURESCENT PAINT, GLOW-PAINT, FLOURESCENT CRAYONS; flourescent chalk. WELCOME TO THE WORLD OF INVISIBLE PAINTING !!! The picture above is a good example of invisible painting. The top 2 pictures are white light. And the bottom picture is black light. This was achieved with regular Crayola crayons ( the box of 120 crayons -has 20 flourescent crayons in it ) the box doesn't tell you that BUT IT IS TRUE. I found this painting color copied onto this afgan and then colored over it with the crayons and some clothe paint. Unfortunatle as great as the crayons are for doing an invisible painting, there is NO BLUE FLOURESCENT CRAYONS in the crayon line. So I had to use FLORESCENT BLUE PAINT ( found in Wal-Mart in the craft section-" fabric paint-" ) It is amazing how invisible the crayons REALLY ARE when you put them on the clothe. But you can see it clearly in the above pictures. 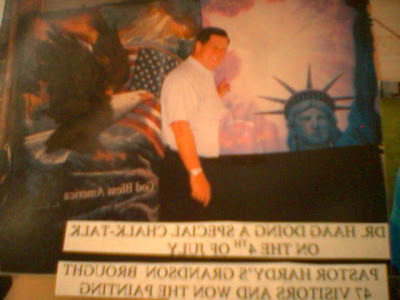 Below is a picture I did for the 4th of July at a camp. The above picture of the Statue of Liberty is a good example of the White paint, white chalk, and white crayons becoming black lines with a black light. WECOME TO THE WORLD OF INVISIBLE PAINTS !!!! These young people painted their painting in our ART-CLASS in Galaz, Va. Dr. Ronny Harrison's Christian school. 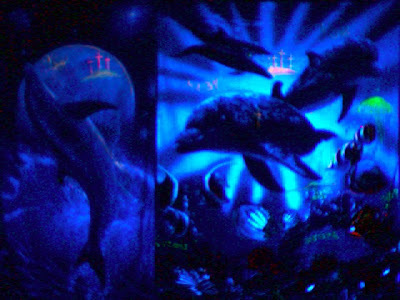 These painting also have an invisible painting when a black light is turned on. 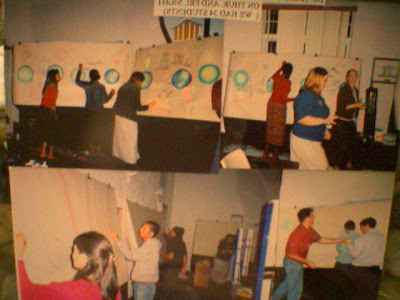 We will be their FEB. 24- SUN THROUGH FRI. 2008, teaching art in the morning and each night I will be doing an invisible chalk-art painting. So come to Landmark Baptist Church, 110 Center St, Galax, Va. Above and below are photos taken from the Chalk-Art class we had at Landmark Baptist College in Haines City, Fla. near Orlando, Fla. Fortunately we were able to video tape those 2 classes. And you can watch them for free on the :" you tube" on the internet ( title: bill haag- CHALK ART with Black Light-session 1 & 2 ), or on our new 24 hour T.V. station: www. Mogulus.com/john 316. We have 18 videos on this station and in the next few days will be adding 120 more CHALK-ART videos in English. Soon we will have our new SPANISH T.V. station running; and our new CHINESE T.V. station running as well. INVISIBLE PAINTING: FLOURESCENT PAINT, GLOW-PAINT, FLOURESCENT CRAYONS; flourescent chalk. 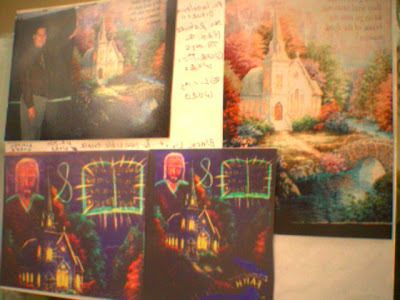 The above 3 pictures are color photos I paint over with Flourescent paint and Fourescent Chalk. 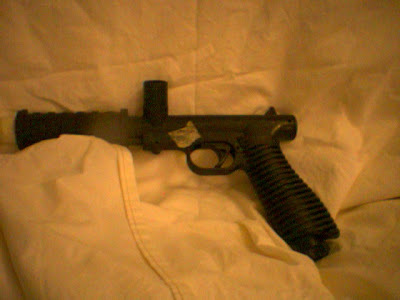 It is used with a black light. 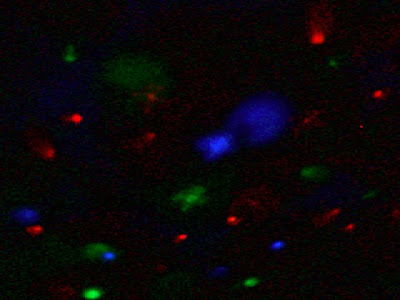 Here is an example of white light and back light on the same color background . WELCOME TO THE WORLD OF INVISIBLE PAINTINGS !!! INVISIBLE PAINTINGS & special effects : Flourescent paint, invisible paint, and "FIRE LIGHTS." 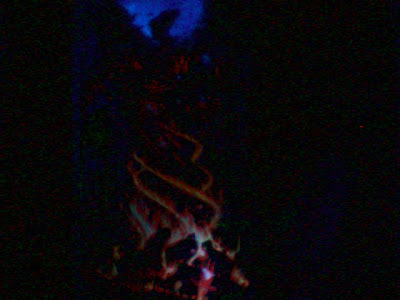 As I mentioned before I sometimes have real fire appear in the painting. (SEE EARLIER BLOGS.) But every day almost, I use these 2 different "FIRE LIGHTS". 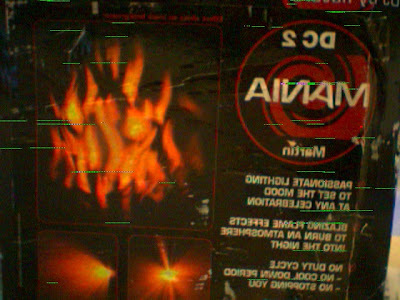 This fire light is promoted for D.J. 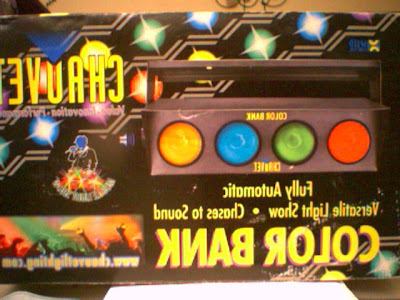 's special light effects. But what I do with it is much more dramatic. 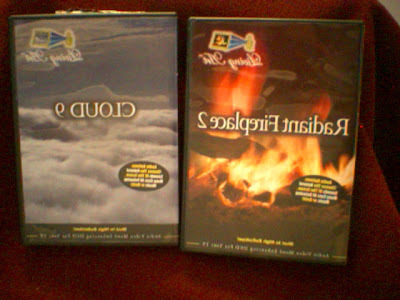 THE 2ED FIRE LIGHT: IS A D.V.D. called " Radiant Fireplace 2"--LIVING ART--BY MOOD DISTRIBUTORS,INC. ( Cost at Apple Barrel about: $ 12.00 .) 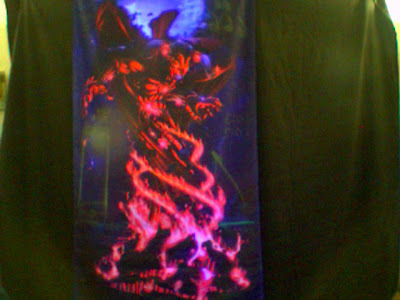 I project this on to the black light painting with my video projector and the lake of fire comes alive. This creates a double surprise at the end. AMAZING !!!! ( YOU CAN SEE HOW I DID THIS IN OUR NEW VIDEO ON "YOUTUBE": look for : cannel -WARN EVERY ONE-- and our new video is: " Pirates of the Caribbean ". The fire is in part 2. 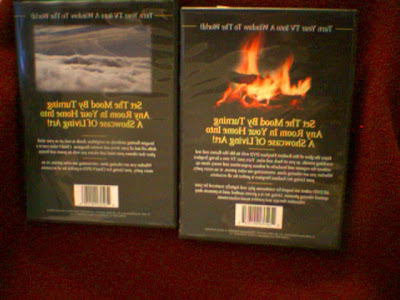 On the left side of these 2 pictures is a real cloud D.V.D. that runs continuously . ( Cost of about $ 12.00 Apple Barrel .) I paint a cloud painting to closely match the D.V.D. with FLOURESCENT CHALK & PAINT, then I turn on the cloud D.V.D. video and the painting comes alive.. This is very dramatic. ....AMAZING !! 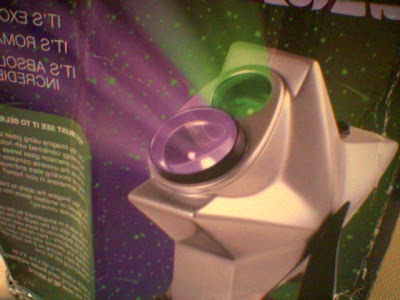 In the photo below, is a green laser star projector, I project this on to the ceiling & onto the painting for special effects. It is very dramatic. So here we have lights projected onto the ceiling with INVISIBLE PAINTING or onto the painting on the board. This creates a very dramatic and surprising effect.. The invisible painting not only "GLOW IN THE DARK" but the painting also "COMES A LIVE ". 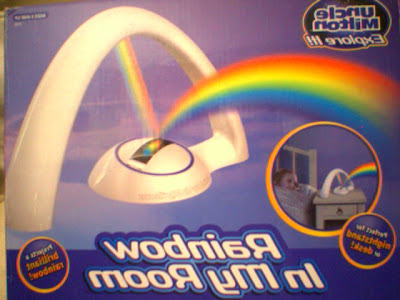 This is an inexpensive ceiling projector for the INVISIBLE PAINTING on the ceiling. 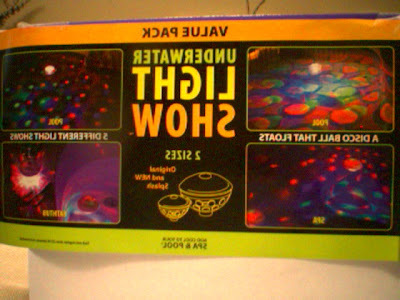 ( Actually this is THE UNDERWATER LIGHT SHOW--$19.95 WAL-MART--) I NOTICED WHEN I PUT THE BATTERIES IN IT ,THAT IT MADE AN EXCELLENT INVISIBLE PAINTING ON THE CEILING. So I have been using it ever since. The above photo is my ceiling in my house. 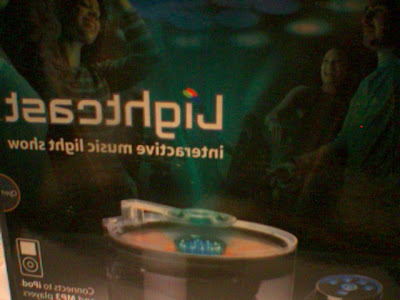 This what the package looks like in Wal-Mart. 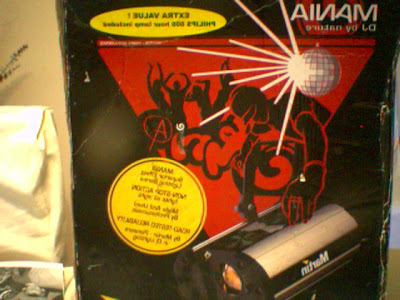 I am now working on a LASER LIGHT- INVISIBLE PAINTING...This is a $ 15.00 lazer light from SPENCERS in the MALL. I project a lazer pattern on the Invisible painting. 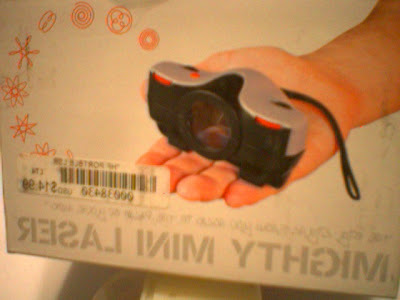 This another light projector for the invisible painting on the ceiling. 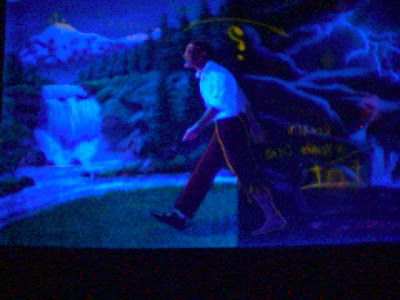 Here I used FLOURESCENT crayons which are invisible until you turn on the black light. ( These are found in a regular box of crayons at Wal-Mart. There are about 5 FLOURESCENT CRAYONS only in the box of 96 crayons. The box of 120 crayons and 150 crayons have about 20 flourescent crayons in them. And the crayons are the only place I have ' FLOURESCENT BROWN " Etc.) I also used flourescent clothe paint for the blue in the water. 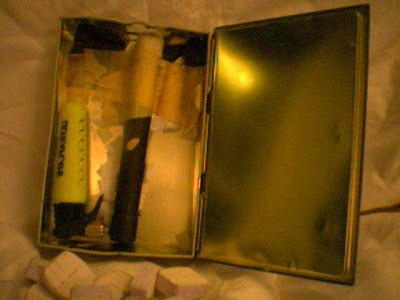 And INVISIBLE CHALK- (prayed afterwards with a fixative spray.) for the purple around the moon.